American, circa 1875. An artful and unique variation of the standard game of Parcheesi. Encircled and painted in red, white and blue are four leaf-like designs and nine raised wooden knobs; eight are in small circles and the ninth is centered in a large bull’s-eye. Boldly executed on the reverse is a decorative reverse-painted on glass game of checkers in red, white and blue. All in original untouched condition with a few minor areas of paint loss on the reverse side. 18" sq. 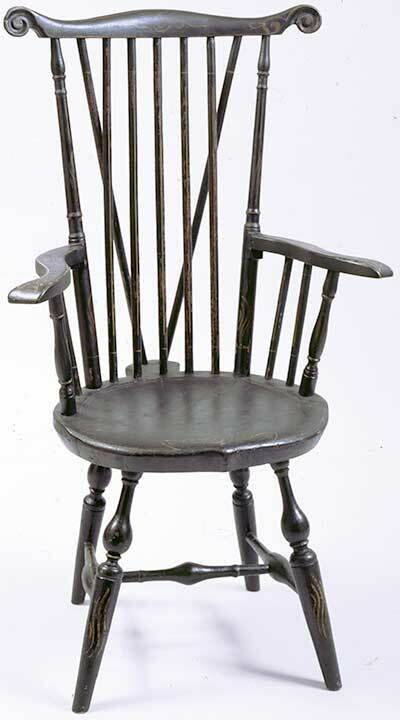 American, pine, last quarter of the 19th century. 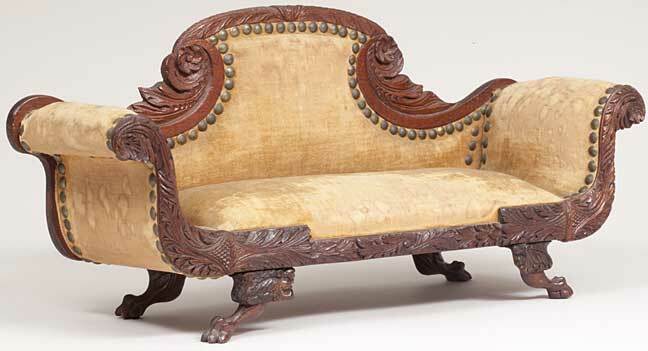 Adorned with symbols of love—hearts, flowers and lovebirds—this unusual piece was most likley made as a marriage gift. It is intricately carved and beautifully painted in reds, greens, blues and silver. 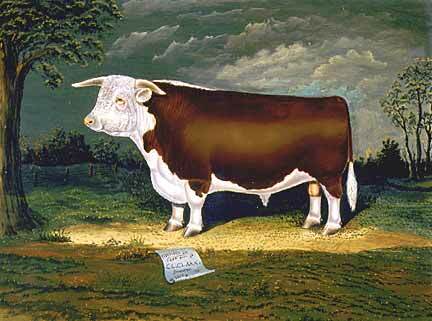 A sophisticated example of folk art at its finest. 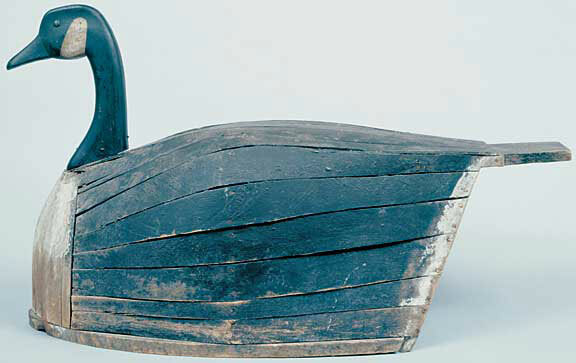 Perdew (1874-1963) is recognized as the premier carver of Illinois River decoys. This pair of mallards, circa 1950-55, exhibit his finest work, i.e. detailed painting, raised carved wings, turned heads and the drake with an unusual carved curled tail. 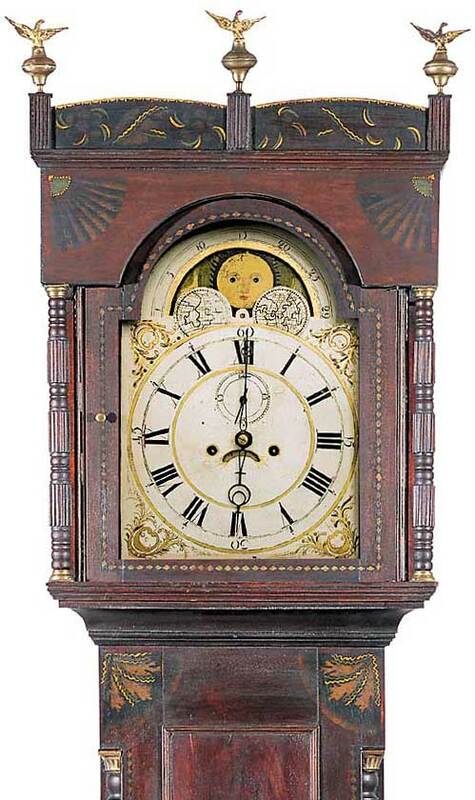 Provenance: Purchased from Charles Perdew by a private Illinois collector. Width 9½ inches. For a similar example and an overview of the life and work of Charles Perdew, see “Perdew: An Illinois River Tradition,” by Ann Tandy Lacy, pg. 200-245. 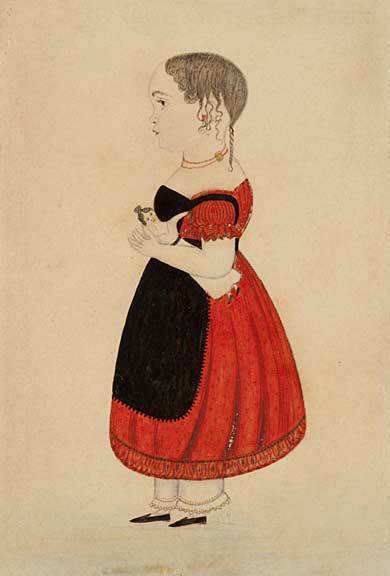 Attributed to Justus Da Lee (1793-1878). 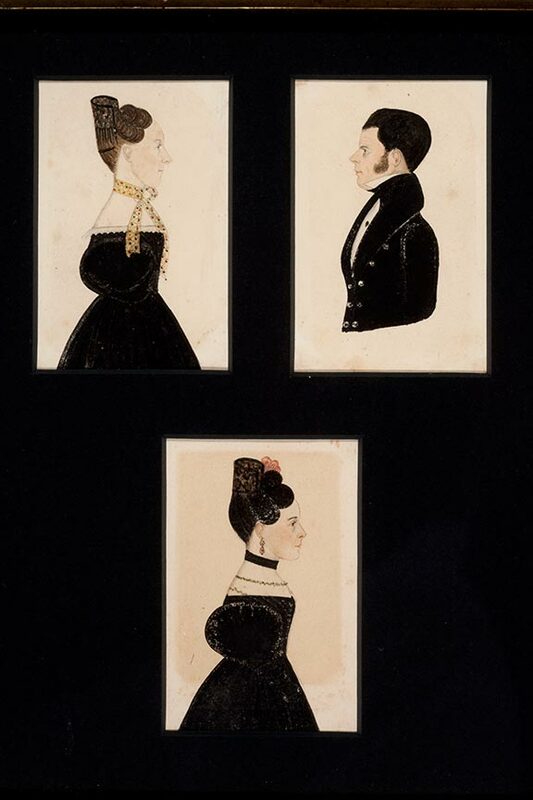 Watercolor and pencil on paper, circa 1840. 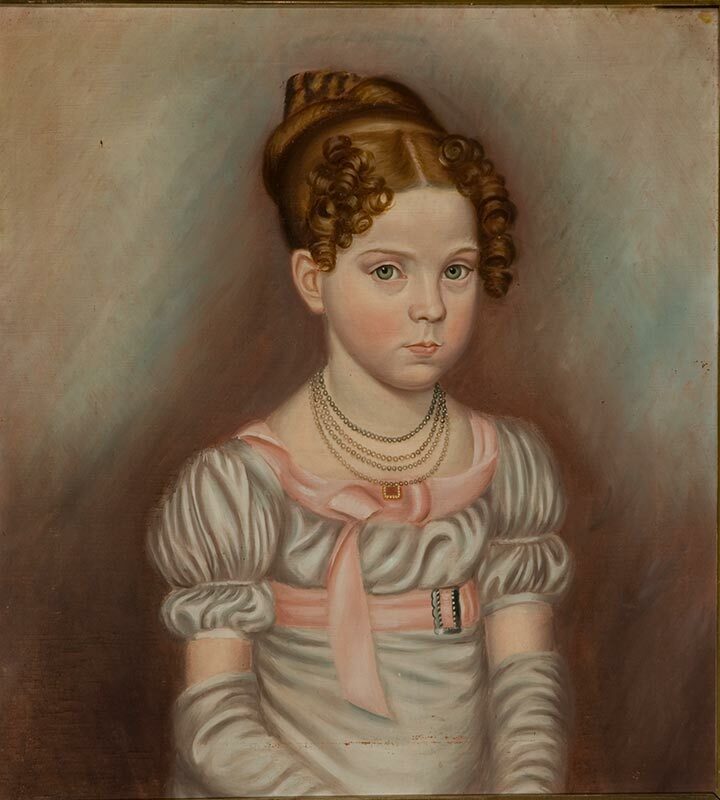 Inscribed on the reverse: “Lucia Caroline aged 2 years 6 months and Charles Augustus aged 4 years 4 months, 1840 Feb Albany.” Da Lee took great pride in painting details and in his use of color as seen in Lucia's red dress and black apron. 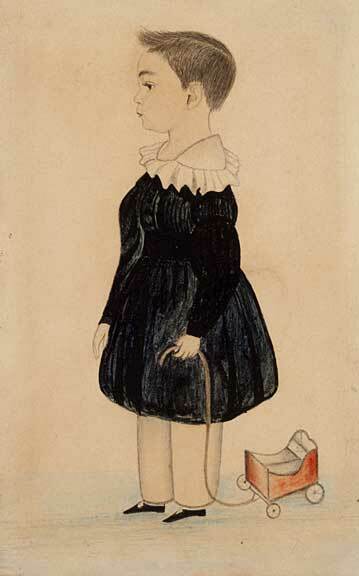 Their delicately drawn faces, hair, and objects they hold are characteristic of his refined stylized work. Sight size 4½" x 2 7/8", 14" x 12" framed. Da Lee Family Artists” by Joan R. Brownstein and Elle Shushan, p. 155, fig. 3. One of a set of four glazed earthenware plates with cockfighting motifs signed “MP,” circa 1940. 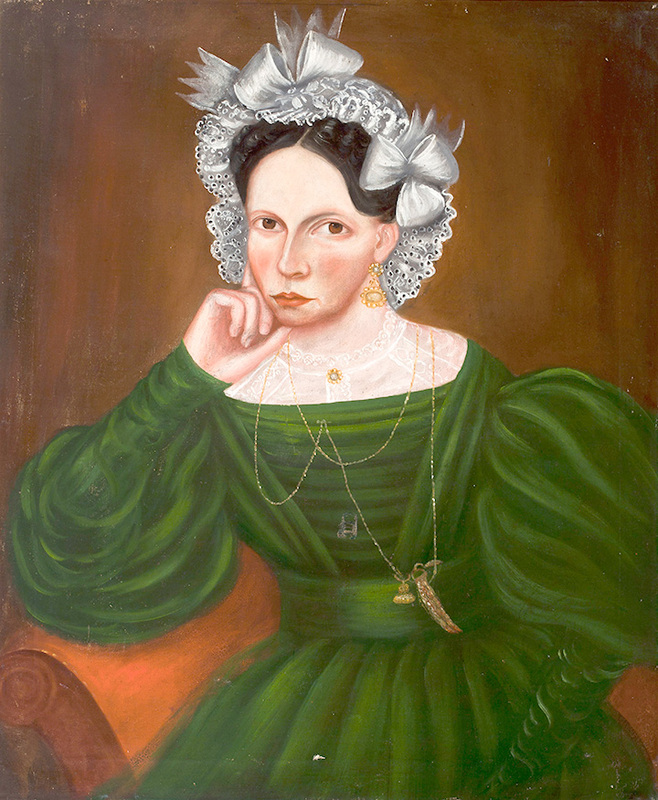 Margaret Perry St. Gaudens (1904-1992) was married to Paul St. Gaudens, nephew to the famous American sculptor Augustus St. Gaudens, and was herself a talented ceramist, textile and jewelry designer. 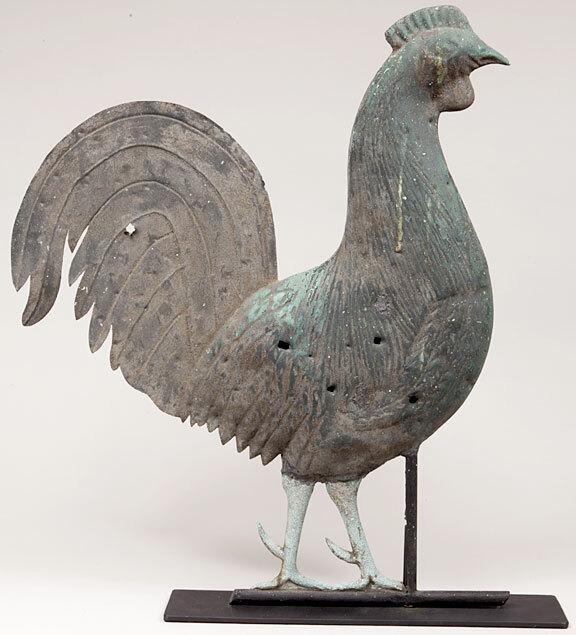 The cockfighting motif is very reminiscent of those seen in William Hunt Diederich’s work. Exhibited: St. Gaudens National Site, Aug. 25-Oct. 31, 2001. Illustrated: “Paul St. Gaudens Ceramic Artist” by Henry Duffy, pg. 117, M 31. 10¼-inch diameter. A fabulous form in original red paint and retaining its original pillows with printed images of General Lafayette surrounded by American eagles. 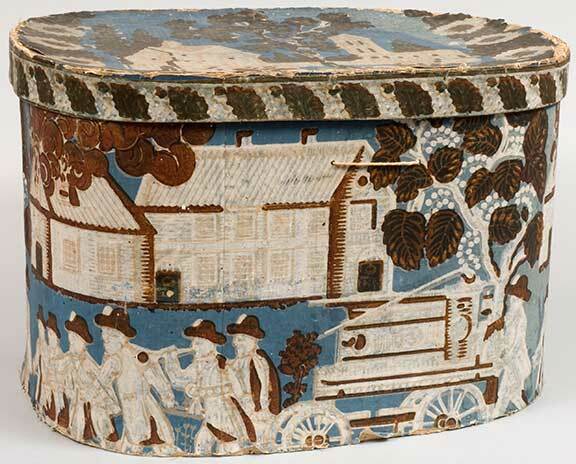 See “Threads of History, Americana Recorded on Cloth” by Herbert Ridgeway Collins, pg. 191. 9½" x 5"
Its papers, “The Volunteer Fireman” and “The Castles in Spain,” depict the engine received in 1830 by the Eagle Engine Company #13 of New York and are in shades of browns, whites, and tans on a vibrant blue background. Pasted inside the cover is a trade card that reads: “Joseph L. Freeman at The Old Hat Stand of Joseph S. Tillinghast, Union Street, New Bedford.” 17¼" wide, 11¼" high, 13 1/8" deep. 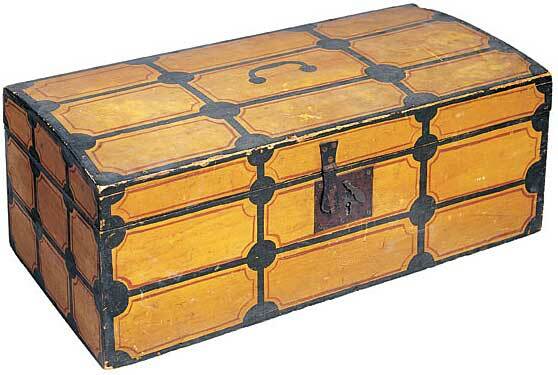 Made by Abigail Voter, born 1820, New Vineyard, Maine, circa 1840. A dynamic textile expressed by the artist’s imaginative composition and use of color. 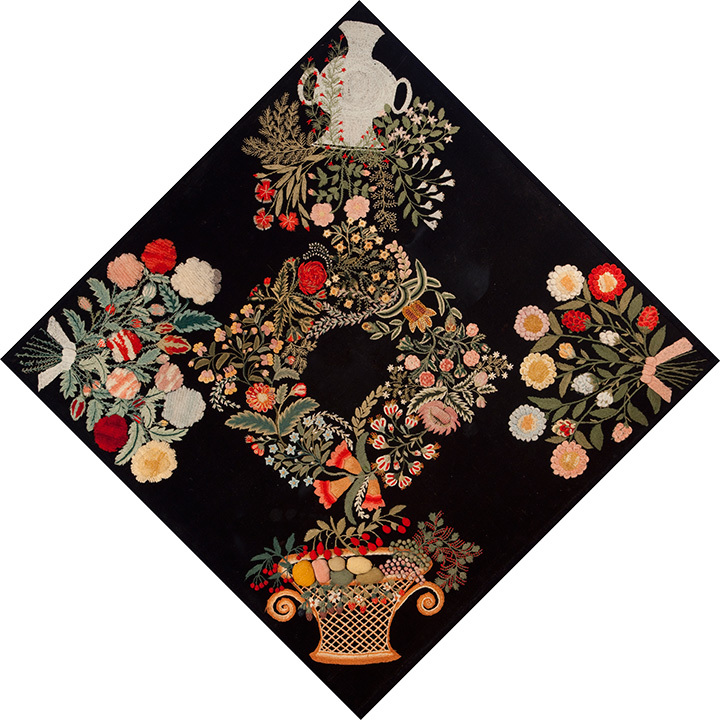 The center is divided into fifteen squares with bursts of flowers and leaves in shades of red, blue, green and tan on a dark brown background. 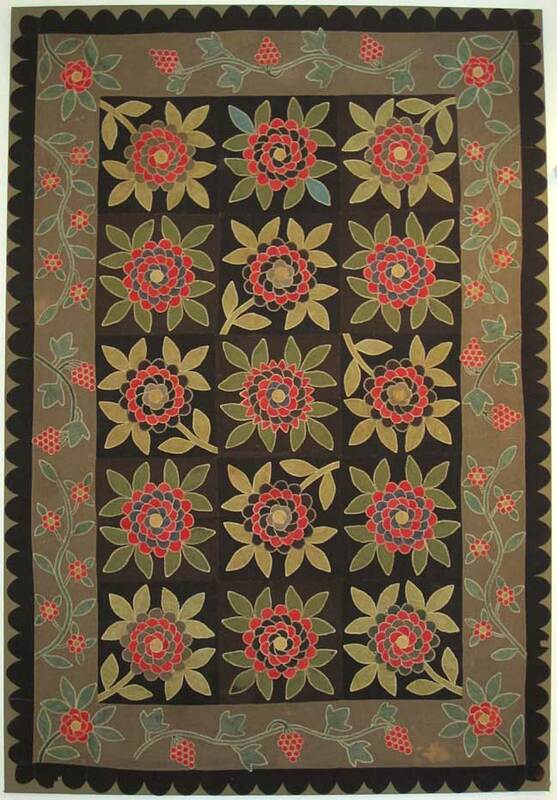 The border has berries, flowers and leaves and is surrounded by a scalloped outer border. 58½" x 86" mounted. Signed and carved on all four sides of the staff: “Abram Cook, Maker, 1906, Canisteo New York.” Wood in untouched original surface. The carved, small objects move freely within the staff. 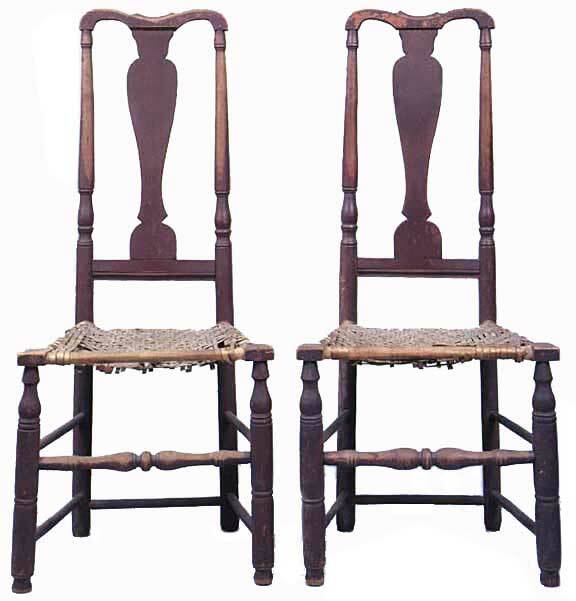 This cane is an example of form and function that transcends into a strong expression of folk art in wood. Height 36". Signed and initialed: “From Life by J.F. Stephens, 1912, Savannah, Missouri.” Oil on academy board in original untouched condition and frames. Described in a scroll on the paintings are the names, weights, and owners of each animal. 22¼ x 28 inches the largest. Attributed to James Sanford Ellsworth (1802-1873). 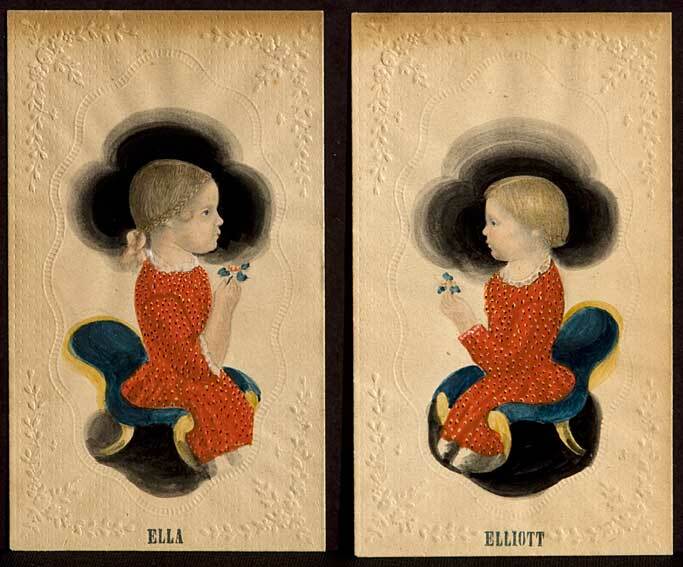 Watercolor on embossed valentine envelopes, circa 1853. These wonderful portraits are superior examples of Ellsworth’s work and illustrate his use of vivid colors seen in the children’s dresses with yellow and black polka dots, the fanicful blue-green and yellow chairs, and the cloverleaf clouds that frame the sitters’ faces. Rarely seen are the children’s names stamped in blue ink under each portrait. 3-3/16" x 2" sight size each, 5¼" x 6¼" framed. 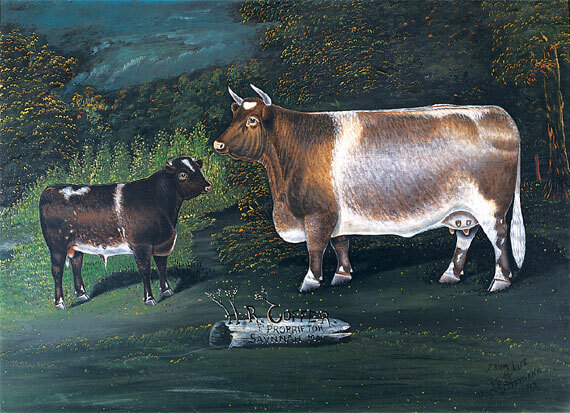 Exhibited: The Abby Aldrich Rockefeller Folk Art Museum, Oct. 13–Dec. 1, 1974.